This week’s OOTW features Jean Tate’s OOTD posted on the 10th of November 2010. It lies 151 million light years away in the constellation Cetus. 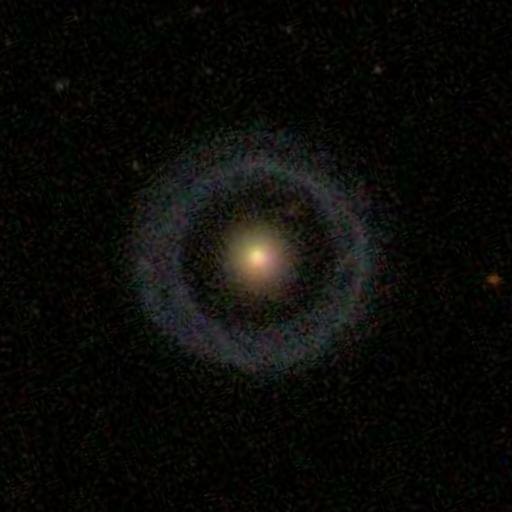 It’s a spiral galaxy with its arms tightly wound so that they complete the rings you see above making it a ringed galaxy, rather than being a ring galaxy where another smaller galaxy passes through the centre, creating a ring of star formation surrounding a core much like the famous Hoag’s Object shown below. I love the contrast between the red inner rings of older stars and the outer ring bubbling with new stars! More information on Truman Henry Stafford here! This weeks OOTW features Lightbulb500’s OOTD posted on the 22nd of October 2010. 1 billion light years away a cosmic train-wreck of two merging galaxies is taking place, throwing stars out in streamers stretching out for thousands of light years in a flurry of gravitational disruption. Deep within this train-wreck at least one super massive black hole has awakened as a result of the infalling matter from the merger, making it a Seyfert 1 galaxy according to SIMBAD. 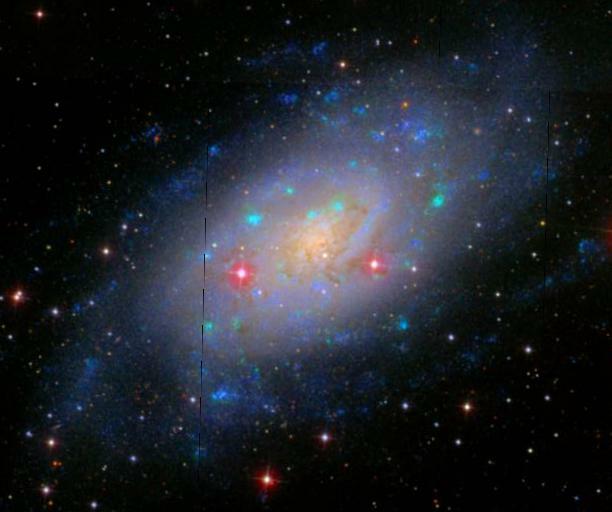 A seyfert 1 galaxy is a galaxy host to an AGN (Active Galactic Nucleus). The matter falling into the black hole forms an accretion disk which in turn creates massive jets of plasma as the disk emits huge amounts of radiation as a result of friction. This radiation gets concentrated into jets of plasma that beam out for thousands of light years! The angle of the jets mostly determines what type an AGN is. There are several types such as the Blazars, the Seyfert 1’s, seyfert 2’s and so on. 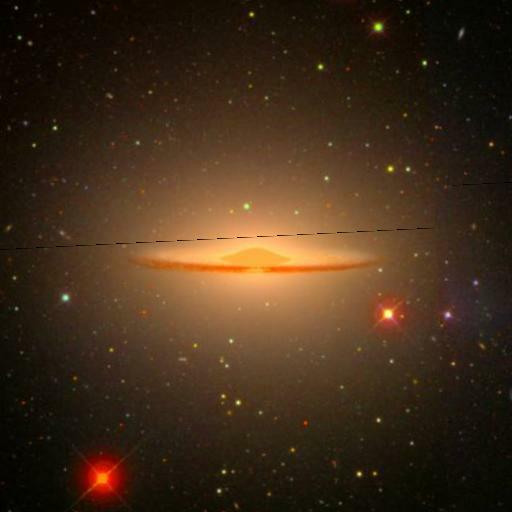 This galaxy is a seyfert one so the jet is beaming out at around 30 degrees so that it’s not quite facing us directly. A blazers jet would be facing directly at us, and the jets of a seyfert two would be at pointing 90 degrees away from us. Eric F Diaz commented in the OOTD thread and asked if the galaxy is a polar ring or not, and Lightbulb500 set up a poll to see what everyone thought. This weeks OOTW features Jean Tate’s OOTD posted on the 20th of October 2010. 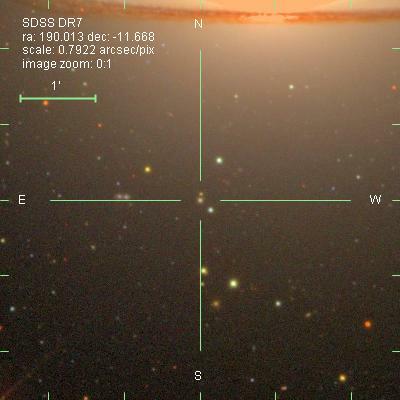 This is SDSS J103843.08+484916.1. It’s a gravitational lens in Ursa Major that Jean calls the ‘Smilie’; and you can see why! So what is the cause of the arcs around the central galaxies? Gravitational lensing is due to the curvature of space. Think of a bowling ball on a trampoline, the trampoline is the fabric of space and the bowling ball is the mass – say a cluster of galaxies – bending it. The more mass the bowling ball has the more it will bend the trampoline, and the same goes for objects in space. The arcs are in fact distorted images of a galaxy that is lurking behind the central galaxies you can see in the image; you can see it much clearer in this Hubble images here. The light from the galaxy behind has followed the curvature of space caused by the huge mass of the central objects, making the light bend around the galaxies as arcs. The left golden fuzzy has a redshift, Z, 0f 0.426, making it around 4.5 billion light years distant. The galaxy that forms the arcs however could be much further away. This is SDSS J120231.00+450349.1; a Cataclysmic Variable star in the constellation Ursa Major. Cataclysmic Variables are stars in a binary system, with one white dwarf and another star of varying type. The white dwarf steals matter from its companion as it orbits closely, often completing an orbit within hours! As the white dwarf pulls the matter off its companion it surrounds itself with an accretion disk mostly made of hydrogen. If this CV was observed in the X-ray or UV you’d see it as strong sources in both wavelengths, as both X-rays and UV are being strongly emitted from the accretion disk! As the name suggests this CV varies in brightness, getting brighter for a period as the accretion disk falls onto the white dwarf, setting off nuclear fusion at the stars surface. In the H-R diagram, there is a thing called the instability strip; stars which fall in this strip pulsate (move in and out, usually radially) … and that pulsation is used, in Cepheids, as a key ‘standard candle’ in the cosmic distance ladder. Some white dwarfs pulsate; some which pulsate are called ZZ Ceti stars, after the variable ZZ Ceti: they are hydrogen WDs (classified as DA), and because they are variable, DAV stars (helium WDs (DB) can be variable too; they are DBVs. I don’t know if carbon (DQ) or metal (DZ) white dwarfs can pulsate). I highly recommend reading her OOTD for a lot more information; and for details on the spectra! This week’s OOTW features Jean Tate’s OOTD posted on the 28th of September. UCDs are very compact objects, with millions of stars crowded into a small area as small as 200 light years across! 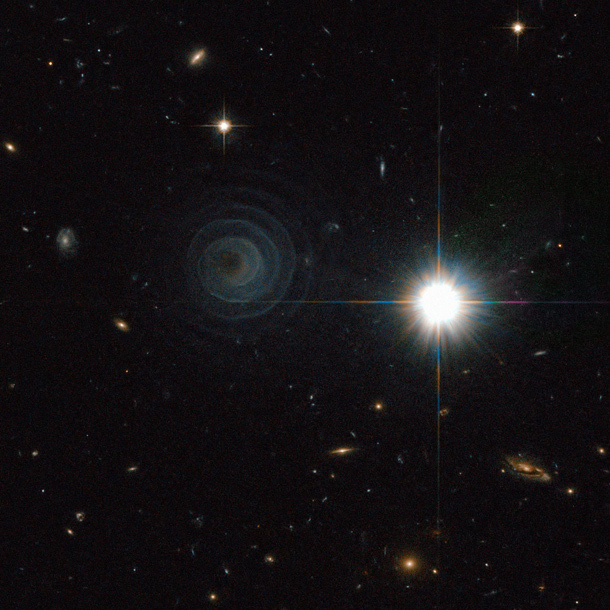 They are rather luminous, showing up on the SDSS as star-like points. The UCDs have been observed in the Fornax cluster, which you can read about in the papers linked to in Jean Tate’s OOTD. These objects are currently the subject of a lot of debate; are they dwarf galaxies or aren’t they? The jury is still well and truly out; however, UCDs do fit several (elliptical) galaxy scaling relationships better than they do globular cluster ones. But perhaps the most intriguing thing is that at least some UCDs seem to have mass-to-light ratios which suggest lots of dark matter, just like dwarf ellipticals (globular clusters seem to have essentially no dark matter) … so perhaps UCDs are not dwarf ellipticals because they are so close to massive cD (giant elliptical) galaxies? This very interesting paper by Michael Hilker et al includes some very interesting scenarios as to how the UCDs form, including the UCDs being remnants of the centres of galaxies, or the result of globular clusters merging or that they are indeed dwarf galaxies! The paper also researches whether UCDs have dark matter haloes or not. This week’s OOTW features JeanTate’s OOTD posted on the 22nd of September. This object has the inventive name of F46 and it lives in the constellation Camelopardalis. It’s not a star, but is in fact a cluster of stars; a globular cluster. It’s not in our galaxy unlike most globular clusters we observe in the night sky, but lies 11 million light years away in the outskirts of NGC 2403; a spiral galaxy that William Herschel discovered in 1788. Globular clusters are balls of thousands of old stars gravitationally bound to each other. They orbit their galaxy around the centre, but instead of following the normal path that most stars take – such as in the disks of spiral galaxies – they orbit their galaxy in the galactic halo, which stretches out farther than what is visible in the image above as a sphere, placing the globulars as much as 100,000 light years away from the centre. F46, being magnitude v 18, is the brightest globular in NGC 2403. But there are plenty more unseen (as far as I can tell) in this SDSS image which you can see in this lovely Hubble image here. Our own galaxy has around 150 or so globular clusters, but many more galaxies have a much higher number; elliptical galaxies for instance have thousands! You can find many beautiful images and spectra in the MAST database here, and at the Hubble Legacy Archive here! This weeks OOTW features Alice’s OOTD featured on the 16th of September 2010. This is IRAS 23166+1655, it may look like a perfect spiral galaxy but it is in fact a pre-planetary nebula, which is a brief burst of nebulosity when a star is in the red giant phase of its life, just before it sheds all of its layers into the interstellar medium as a Planetary Nebula. The cause of the nebula, a carbon star called LL Pegasi, is shrouded by the thick shells of dust and gas that surrounds it and another star, which is gravitationally bound to the other. Which is part of my mass! So I tell you, it’s making me furious! You can read more about the spiral here! This weeks OOTW features Rick Nowell’s OOTD posted on the 10th of September 2010. In the middle of all these Planetary Nebulae are the culprits; a core of a low mass star below 9 solar masses. 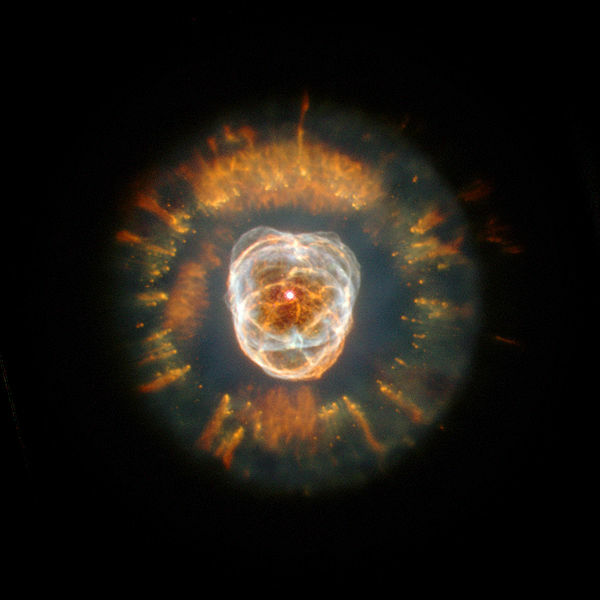 The star at the centre of the Eskimo nebula, at the end of its life when it had became a red giant, threw off all its layers until only its core was left, going from a star much like our sun to a tiny white dwarf. 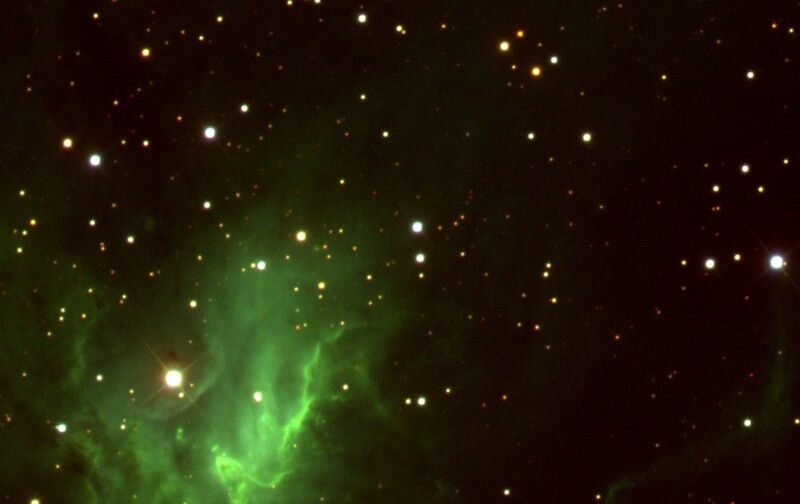 The patterns of ionized gas you can see in the image are around a light year across! This object will remain visible in our skies for a few thousand or so years until it fades away, its gas spreading out into the interstellar medium and contributing to the formation of new stars. Today’s OOTW features Alice’s OOTD written on the 2nd of September 2010. This is NGC 1491, a HII region lurking in the Perseus constellation just above the star Lambda Persei. HII regions are what they say on the tin; they are made of of hydrogen gas, a considerable amount of which has been ionized by radiation coming from the shorter wavelengths of the electromagnetic spectrum. HII regions are ionized after a nebula has finished forming a new batch of stars; the regions that shroud the stars get blown away by the winds given off by the stars, creating the bubbles and filaments in the nebula. As these stars emit huge amounts of ultraviolet light they ionize – meaning the ultraviolet light shoves off the electrons from the atoms that make up the hydrogen gas – everything surrounding them, heating up the clouds of nebulous material and lighting it up, creating great eye candy for us! 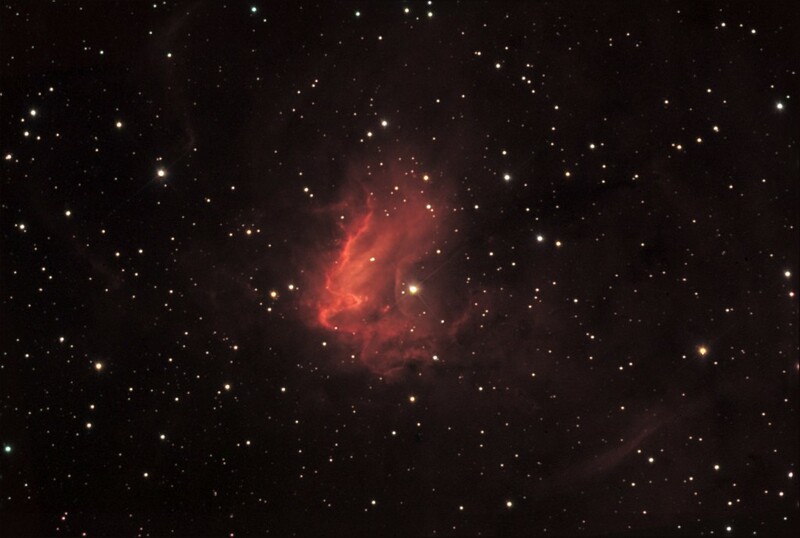 Unfortunately I couldn’t find any files that give the full view of the nebula! Why a nebula? Because nebulae might well soon be on the menu. They’re part of Project IX, whose exact definition is still . . . well . . . nebulous! Well, let’s collapse those clouds and make it less so. Can you suggest a name? They’re looking forward to hearing from you! This week’s OOTW features Lightbulb500’s OOTD posted on the 27th of August. 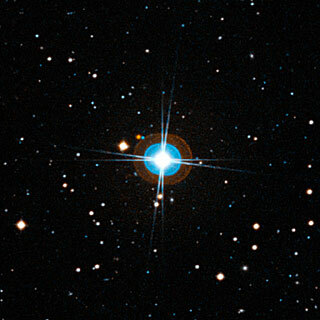 This star, HD 10180, lurks in Hydrus 127 light years away. It’s a sun-like star, and through 190 observations of the stars wobble with the High Accuracy Radial Velocity Planet Searcher (phew) it is found to have five gas giants, and two more wobbles are suspected to be due to two or more additional planets! One it has been proposed is another gas giant, much like Saturn, and the second planet is thought to be Earth-sized, but although it could be the right size for life, its orbit around HD 10180’s solar system certainly isn’t the best at 0.02 arc seconds from the star, to give you an idea of how close that is, it orbits its star in 1.8 Earth days! Toast anyone? Read more about this planetary system here, and there’s a wonderful video on the system here!